It might’ve have taken a bit longer than anticipated, but in last Saturday night’s ninth World Series Sprintcar Championship round at Latrobe’s Gulf Western & Independent Oils Raceway in Tasmania, Jamie Veal and the Krikke Motorsport team opened their 2017-18 season WSS winning account. In what was the duo’s third feature-race win of the season, which includes the Western Australian Title and the Australian Championship preliminary feature race, Veal, steering the WA # 2 Transport Equipment Hire / Pumpa Manufacturing supported Maxim, impressively qualified on pole position and then went on to dominate the entire 30-lap feature-race journey. With a previous season best WSS round finish of second in round five at Warrnambool’s Premier Speedway, Veal, the 2016 WSS Champion, was rapt to get into victory lane, not only for himself but the entire Krikke Motorsport team. “It’s been a tough season for us so far, but we have never been lacking car speed and not once have we dropped our heads and all of our continued hard work and persistence is paying off,” expressed a jubilant Veal, who now sits second (2244) in the WSS Championship point standings behind leader James McFadden (2525). The previous night’s eighth WSS Championship round at Gulf Western & Independent Oils Raceway was a tough night for Veal. 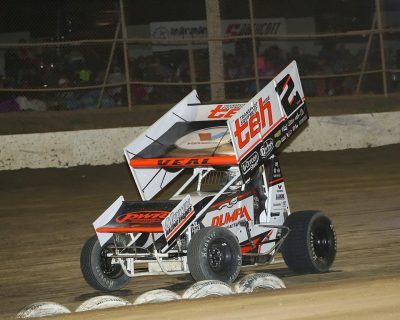 He crashed out in his second heat race in the extremely tough track conditions, but the team managed to hastily repair the car and then had to qualify for the feature race via the B main. In the feature race, he went on to finish in ninth place. Veal and the team remain in Tasmania for this Saturday night’s 10th WSS round at Hobart Solo Speedway. The Krikke Motorsport team’s 2017-18 season team merchandise, including t-shirts, hoodies and hats which are available in a range of sizes, can be purchased through the team’s online store via the following link: www.krikkemotorsport.store. Fans can also purchase merchandise at the track with cash or directly from the Bunbury Subaru dealership. Krikke Motorsport would like to thank the following 2017-18 season sponsors: Transport Equipment Hire, Pumpa Manufacturing, Maxwill Racing Engines, PWR Performance Products, Valvoline Oils, Gowans Performance, Orrcon Steel, Darby’s Paints, Bunbury Toyota, BR Motorsports, Vortex Racing Products, A. Lucas Spraypainters, Skwid Signs, and Redline Media.